This appropriation funds grants to various charitable, educational, and welfare-to-work programs. The following is a list of those programs, a brief description, and the amount that could be saved by eliminating the program. Adult Basic Education. This program is designed to teach basic math, literacy and English as a second language to Michigan adults. This line item is but one of several appropriations designed to help adults achieve rudimentary literacy skills. Like many other programs, adult education is well intentioned and needed. This service, however, is best provided and funded by local community organizations and businesses, not state or federal government. State and federal mismanagement of K-12 education is a primary reason that so many adults require remedial education or skill enhancement; more state and federal intervention is a poor solution. High schools should guarantee their diplomas and provide remedial education free of charge to those who graduate without basic skills. There are also many for-profit and nonprofit organizations providing a vast array of basic and advanced training, and adults have sufficient incentives to seek them out when necessary. This line item is part of the Workforce Investment Act, described above, and should be eliminated. Savings: $13,500,000. Council of Michigan Foundations. The Council of Michigan Foundations is a nonprofit organization located in Grand Haven. Its mission is to assist philanthropists, corporations, and non-profits in their charitable work. The Council has more than 400 members. This appropriation is funded solely through money derived from the lawsuit settlement between the U.S. government and the major tobacco companies, and is used for initiatives related to senior and youth health. The work of charities is best undertaken with voluntary charitable contributions, not government funding. These funds should be redirected to the General Fund/General Purpose budget to support core governmental functions. Savings: $3,000,000. Focus: HOPE. Focus: HOPE is a well known, Detroit-area civil- and human- rights organization that is dedicated to improving humanity through multi-cultural charitable and education programs. It charges nominal fees for some of its work and uses its MDCD grant for job training. There is no reason to believe that this exemplary organization, and others like it, would not succeed without government subsidies. The majority of Focus: HOPE’s revenue comes from private sources, as does that of countless religious organizations that provide job training and education as part of their own social services network. This appropriation should be eliminated. Savings: $5,744,300. Gear-up program grants. The Gear-up program was established in 1998 to help increase the number of low-income students who are ready to enter college each year. Children from three school districts will work in partnership with scholars at Central Michigan University to improve their pre-college knowledge. Special programs to prepare and motivate low-income students to pursue undergraduate degrees are well intentioned and needed, but should be funded and provided by private charitable organizations, businesses and individuals. Many such programs already exist, and should not be forced to compete with the government for funding. Savings: $3,000,000. Job training programs sub-grantees. These grants support the work of Michigan’s 25 Michigan Works! Agencies, which are described above. The line item is part of the WIA program. Savings: $98,802,700. Michigan Community Service Commission sub-grantees. Sub-grantees are organizations that receive government grants to help foster volunteerism in Michigan. 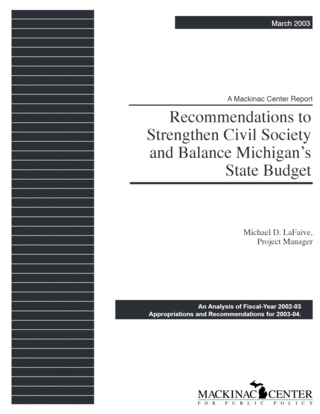 The work of the MCSC, and the reason it should be eliminated, is described in “Workforce Development” (section III above), under the program “employment training services.” Savings: $6,757,300. Personal assistance services. This appropriation funds personal assistance for people with disabilities at their place of work. As with other social service programs, the intention of this program is laudable. Such services, however, should be provided and funded by private charitable organizations, businesses, and individuals, preferably community-based programs, which best understand local needs. Savings: $462,000. Pre-college programs in engineering and the sciences. This appropriation funds the Detroit and Grand Rapids area Pre-College Engineering programs, which are designed to prepare and motivate students to pursue degrees in engineering or the sciences. Assistance, however, should be provided by private, charitable organizations, businesses, and individuals, preferably community-based programs which best understand local needs. Kettering University runs such programs and does so without state aid. Savings: $940,200. Supported employment grants. The appropriation funds employment grants designed to help individuals with disabilities obtain work with the help of job “coaches” in their respective communities. As with other social services described in this and other chapters, these services need not be provided by government. Savings: $1,441,300. Technology assistance grants. This appropriation funds the state program “Tech 2000,” which helps local communities obtain high-technology equipment for job training. If it is necessary, this service should be provided and funded by private charitable organizations, businesses, and individuals, preferably community-based programs, which best understand local needs. Many organizations and businesses, both for-profit and nonprofit, already provide a panoply of job training programs. Savings: $1,378,700. Carl D. Perkins Grants. These federal grants help fund new curriculum development, professional development for teachers, and help create relationships between vocational-technology programs and educators throughout Michigan high schools and community colleges. This program attempts to assist students in obtaining vocational-education training. Federal intervention has eroded the historic and effective role of labor unions and companies in vocational training, The state of Michigan could call upon the federal government to end its involvement in these programs and eliminate this appropriation. (For information on refusing federal funds, see Appendix I.) Institutions of civil society have been providing vocational training without government aid for years. For example, the Ford Corporation and the U.A.W. run a joint apprenticeship program in New Boston that has helped 30,000 hourly employees earn credentials as tradesman since 1941. Programs such as this have been very effective, and cost-free to taxpayers. Savings: $42,500,000. Vocational rehabilitation client services/facilities. This appropriation funds rehabilitation and independent living services for workers with disabilities. As discussed elsewhere in this report, job training or retraining is fundamentally the responsibility of employers, employees, and private organizations — not the state or federal governments. Savings: $51,339,200. Vocational rehabilitation independent living. This appropriation funds 10 Centers for Independent Living in Michigan. These centers work to provide services and resources for people with disabilities. As with the two line items directly above, there is no question that disabled individuals require assistance in learning certain skills. Such assistance should be provided and funded by private charitable organizations, businesses, and individuals — preferably community-based programs, which best understand local needs. State support for these sites should be eliminated. Savings: $3,190,700. Welfare-to-work programs. Funding for this appropriation stems from the federal government’s Personal Responsibility Act of 1996. The program, which is administered by the state’s Michigan Works! Association, is designed to increase the ability of welfare recipients to become employed with the help of non-cash assistance, such as transportation, clothing, and medical examinations. While this system represents an improvement over the welfare system that preceded it, it still drains communities of resources, filters them through expensive state and federal bureaucracies, and returns a portion — with strings attached — to local communities. As a first step toward making sizeable reductions in Michigan’s own public assistance and service programs through the Family Independence Agency, the state should refuse federal funding for this program. (For information on refusing federal funds, see Appendix I.) The federal government maintains the prerogative of running the system itself directly in Michigan if it chooses. There is no compelling reason to pass this money through the state. Savings: $72,898,600. Michigan Virtual University. This program began in 1998 as a private, nonprofit institution designed to deliver online education services in Michigan. While it is technically a private institution, it was created by former Gov. Engler, and by the quasi-public Michigan Economic Development Corporation, with state resources. The state of Michigan already funds educational opportunities through K-12 schooling, community colleges and universities. Adding this marginal program is both unnecessary and unfair. Private, for-profit providers of online education services, such as the University of Phoenix, do not receive state appropriations, yet they are forced to compete with those who do. In addition, private schools such as Michigan’s Baker College — as well as many public universities — maintain an online presence as well, and business is booming. Baker currently has 2,800 students taking one or more of 278 undergraduate and post-graduate courses online. The private sector should provide all of these services free of state intrusions. Savings: $1,000,000. Recommended Action: All of the programs listed above should be eliminated for the reasons provided. Savings: $305,955,000. This appropriation funds the employment service agency. This agency maintains four program line items: Workers’ compensation; building occupancy charges; employment service positions; and labor market information. Workers’ compensation simply pays the premiums for insurance of the employees working in this department. The building occupancy charges represent payment for lease obligations. The employment services positions line item funds administrative staff and program support for Michigan’s Michigan Works! Service Centers (described above, in section III, “Workforce Development”). The labor market information section funds staff that produce reports on statewide labor information. All of these items should be eliminated with the rest of the department. There is no need for Workers’ compensation and employment service positions for a department that no longer exists. Labor market information maintained by the state is not a necessary function of state government and most of the data provided by this service is readily available on other free web sites maintained by the federal government. Savings: $49,203,600. This appropriation funds the information technology services program for the department. This line item represents the transfer of revenues from the Michigan Department of Career Development to Michigan’s Department of Information Technology as payment for technology services used by the MDCD. This appropriation should be eliminated with the rest of the department. Savings: $6,492,700.